The NHL playoffs will forever be the best month and a half of television that you can find. No matter who is in the tournament, the yearly battle for the Stanley Cup is some of the most dramatic and captivating television you can find. 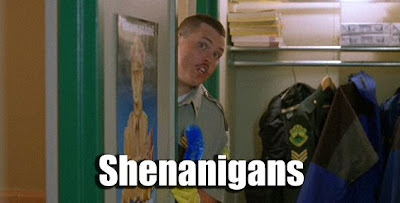 Even with all of the shenanigans, this year has yet to disappoint. The nightly gongshow that has become the 2012 Stanley Cup Playoffs has become appointment television that even the most casual of hockey fans have found interest with. The ratings from the Pittsburgh/Philadelphia ratings do all the talking. Say what you will, but the physical nature of the Penguins/Flyers series has been terrific television. However, things are starting to spiral out of control. From the lack of respect from the players, the lack of control from the officials to the lack of consistency from the league, some major problems have come to a head through just half of round one. Yet, I do have to ask, is this all bad for the game? Obviously the ridiculous hits and headhunting are an ugly addition to these playoffs and need to be stopped. However, the fights and line brawls have to bring some extra spice for those casual viewers who may not be true hockey fans. Think about it, casual sports fans think hockey is all about fighting; these playoffs have provided plenty of that. There has even been some decent numbers in the goal scoring department, another category that is referenced when bemoaning television viewership. While the offense hasn’t surpassed the magical six goals per game mark – 5.28 goals per game entering Wednesday – nearly every game has been a blast to watch. Personally, five goals in a game is really all you need. A 3-2 game is typically thrilling and features nearly two goals per period, you can’t ask for too much more. Also consider that there have been eight overtime games played of the 25 so far in these playoffs. Those OT games are basically canned drama that any fan could find interesting. Even the scoring numbers have been slightly skewed. Considering there have been three 1-0 games and two additional three-goal contests, the scoring could be much higher. Another factor that has skewed some of the numbers has been the Penguins and Flyers. Of the 132 goals scored in these playoffs, these two teams have accounted for 32(!) of them. That is a whopping 10.667 goals per game average (it would be higher if it wasn’t for that blasted 4-3 OT game one). Dirty hits have sullied the first round of the 2012 playoffs. 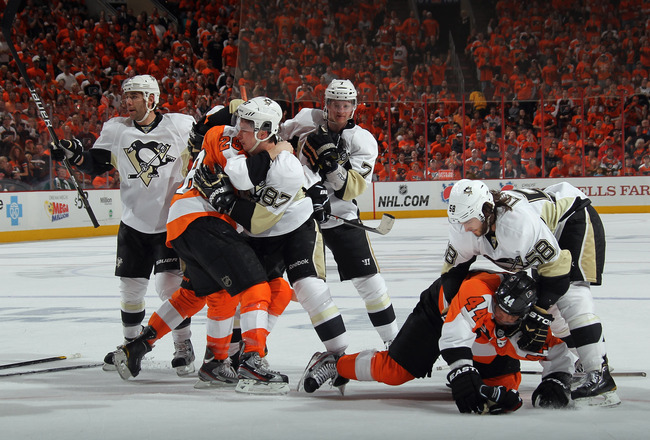 The Penguins/Flyers series has easily been some of the most entertaining hockey I have seen in some time. Between awful goaltending, tons of goals and the nightly bloodbath, the series has lived up to what everyone expected. This is exactly the type of hockey that needs to be brought to a national audience. There has basically been one or two melees each game and a bushel basket of goals. Say what you will about putting skill over brutality, but those who are new or oblivious to the game will drool over the fights and stay for the goals.What needs to be stopped are the ridiculous hits and attacks that have become so prevalent. Raffi Torres is the most recent culprit for his annihilation of Marian Hossa. This just two days after a disgusting display by the Penguins that brought about a trio of suspensions. Nearly every series has been tarnished by at least one fine or suspension resulting in from a dirty play. Yet, it doesn’t seem like the League is capable of getting things under control. Brendan Shanahan failed to set the bar when Shea Weber Webered Henrik Zetterberg at the end of game one. The paltry $2,500 handed to Weber made it open season for everyone else. The fact that Shanahan justified his ruling because Zetterberg wasn’t injured shows exactly what has yet to change with the NHL discipline system since Sheriff Shanny took over. Judging rulings because of injuries, not actions is incredibly ignorant and that needs to stop immediately. Not to mention, the fines need to be changed immediately if they are to act as any sort of deterrent. Five suspensions have come from hits to the head and each has been given a different length, despite the severity of the hit. The Torres and James Neal hits are actually a great barometer for the broken system. Virtually the same play netted Neal, a 40-goal scorer, one game and Torres an indefinite ban. However, both showed the same intent of burying their opponent on each hit, it just so happens that Torres sent his recipient off on a stretcher and Neal did not. However, Neal spent his entire shift headhunting Flyers, yet didn’t receive any more punishment for his actions. Of course, the referees are also failing to control the games in which they’re working. No penalty was assessed to Torres and the fact that so many games have deteriorated to line brawls tells me that the zebras aren’t exhibiting enough authority in these games. There have been countless incidents that the referees have failed to contain and that lack of action is tarnishing the game just as the dangerous hits are. With or without the struggles of the referees, the NHL discipline system is beyond broken. There is too much grey area for every review. It is about time this ridiculously flawed system to change and actually hold players accountable for their actions. It should be easy to devise. There should be a set punishment for each infraction and there should be no debate. If a situation arises where there is clearly more intent that would warrant additional punishment, that is when more analysis can be given. But the new CBA should address a set guide for each and every infraction, that way there can be no debate as to the line of thinking Shanahan is using. For example: if player X hits player Y with clear contact to the head, he is subject to a 2-4 game suspension. If player B runs into/over goalie A, that player will be subject to a 1-3 game suspension. There is some wiggle room here because there are situations like Shaw on Smith which probably warrant a smaller suspension to a full collision like Lucic or even Tootoo. The same goes for hits to the head. If the tape shows more of an effort to make contact (Duncan Keith), then the punishment is more severe. Extremely egregious infractions, like Torres, should still be subject to further in order to determine an appropriate suspension. There is still some grey area with this approach, but the foundation is far more structured than the current pin the tail on the donkey system. If there were clear cut guidelines for suspensions there would be no debate over situations like Backstrom’s cross check or Neal’s actions. When the League realizes they need to truly buckle down on punishing their players, perhaps then the players will respond with more respectful play.